Genetic engineering is the process by which an organism's genetic material is altered or selected so that the organism will have specific characteristics. Cloning - One of the most controversial uses of genetic engineering has been cloning, or producing a genetically identical copy of an organism. While the ethics of cloning are hotly debated, the first ever sheep (named Dolly) was cloned in 1996 by scientists. Glow-in-the-dark cats - It sounds strange, but in 2007, scientists in South Korea altered the DNA of a kitty so that its fur would glow in the dark, and then cloned other cats from it, making the world's first glowing cats. Pesticide-resistant rapeseed plants - Rapeseed is a flowering plant used to make certain types of vegetable oil. 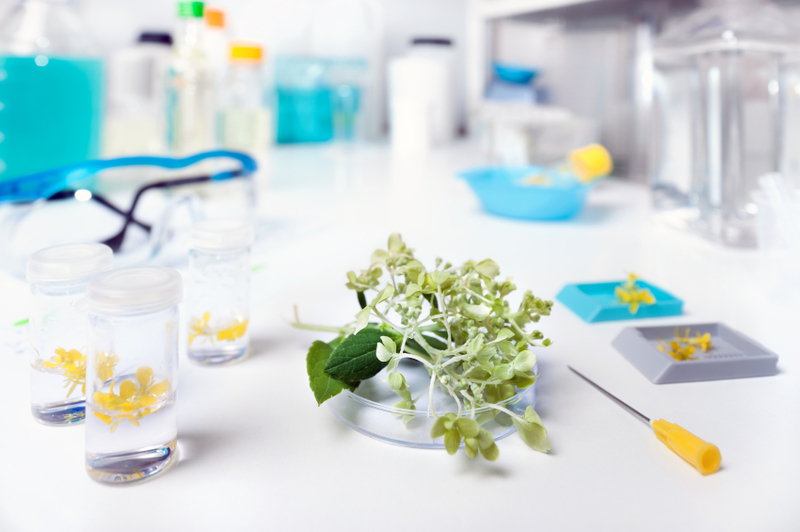 Genetic engineering has allowed these plants to be resistant to certain types of pesticides, so that when the fields are treated to remove pests, the plants will remain unscathed. Cows that pass less gas - Methane is produced by cow flatulence, and the chemical is a huge contributor to global warming. Cows that fart less than average have been produced to fight the deleterious effects that cow flatulence can have on the environment. Plants that fight pollution - Poplar trees developed by scientists at the University of Washington can absorb polluted water through their roots and clean it before the water is released back into the air. The plants were many times more efficient at cleaning certain pollutants than regular poplars. Golden rice - Genetic modification is often used to make "healthier" foods, such as golden rice, which contains beta-carotene - the very same vitamin that makes carrots orange. The result is that people without access to many vitamins will get a healthy dose of vitamin A when the rice is consumed. Environmentally friendly pigs - Genetic modification has helped to create pigs that can digest phosphorous better, which decreases the pig's phosphorous output. The result is that manure, which is often made from pig waste, is less destructive to the environment due to its lower phosphorous content. Faster-growing trees - Demand for wood can be met by trees that grow faster than average. Genetic engineering has produced trees that can ward off biological attacks, grow more quickly and strongly, and create better wood than trees that are not genetically modified. Bigger, longer-lasting tomatoes - When tomatoes are genetically engineered, they can be made bigger and more robust. These are engineered to produce tomatoes that can remain fresh for longer, can be shipped farther from where they are grown, and can be harvested all at the same time rather than harvesting only parts of a field at each harvest. Salmon that grow faster - Salmon do not produce growth hormones year-round, so scientists have looked toward genetic engineering and found a solution: a modification that allows salmon to grow twice as fast than those that are not engineered. Insecticide corn - Instead of spraying insecticide on plants, why not genetically engineer crops that kill pests on their own? Corn was developed through genetic engineering to produce a poison that kills insects. While this corn may also harm beneficial insects such as butterflies, supporters say that the pros outweigh the cons. The banana vaccine - Bananas were developed through genetic modification that offer vaccine against diseases such as cholera and hepatitis. Just like with a needle vaccine, people who eat them develop disease-combating antibodies that make them immune to a disease. As some of these examples show, genetic engineering can be a controversial science; but, it may also serve many useful purposes. "Examples of Genetic Engineering." YourDictionary, n.d. Web. 18 April 2019. <https://examples.yourdictionary.com/examples-of-genetic-engineering.html>. Genetic engineering is the process by which an organism’s genetic material is altered or selected so that the organism will have specific characteristics.